The "off billet" is the leather strap attached to the front D-ring on the right side of the rigging on your horse's Western saddle. Its purpose is to support the girth, which wraps around the horse's barrel. The right side of the girth buckles to the off billet. The off billet is not a permanent fixture of the saddle; you can remove and replace it or swap it out as necessary. 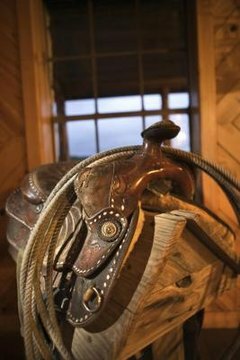 It is tied to the saddle using a piece of leather latigo string. Place your off billet on the D-ring located at the front right of your saddle's rigging area. The off billet should fold neatly in half over the D-ring so that half of the billet is hanging on either side of the metal ring. Locate the three holes clustered together on either side of the top of the off billet when it is hanging from the D-ring. The holes form a triangle, with two holes on the bottom and the third hole less than an inch above them. Each side of the billet has these three holes, and they line up together when the off billet is in the proper position. This is where you will tie the latigo so the off billet will stay in place while you are riding. Insert the one end of your latigo into one of the two bottom holes in the off billet. Insert the other end of the latigo through the other bottom hole. Pull both ends of the latigo through the middle of the off billet and out the other side. This will form a shallow loop of latigo on the front of the off billet. You want an even amount of latigo on each side of the back of the off billet at this point. Bring both ends of the latigo back up through the top hole on the back side of the off billet and then out through the front so the ends of the latigo are together directly above the loop you created earlier from the middle of the latigo. Pull the ends through the hole and then stick them down through the loop and pull the knot as tight as you can so that there is no slack in it. ⚠ An improperly tied billet can cause your girth to come loose. Until you know you're tying it right, get a professional to check it before you ride in the saddle.